This classic timepiece shows the world you have an affinity for discerning tastes, and provides you with the technology that respects you to the core of your being. The 41mm case exudes style personified. Inside the case lays the mechanical wonder of the NG2824A movement, certified by the Contrôle Officiel Suisse des Chronomètres, the Official Swiss Chronometer Testing Institute, and is rated to 100-meter depths for pressure. The bracelet mechanics meld fine, Swiss-watchmaking traditions with the support of the 38mm Apple Watch, included for the insightful Nico Gerard clients that preorder this elegant marvel. As you go higher up a mountain, the color of the sky changes. Looking out from a summit in the Alps to the view evokes wonder and awe. The beauty and brilliance of the blue sky are the inspiration for the Nico Gerard Skyview PINNACLE. Wherever you go, this timepiece can make the trip with you. Pride in the elegance of the 41 mm case will be yours as you live life as a connoisseur. The Nico Gerard Skyview PINNACLE is limited to 99 timepieces. The tranquil morning dew is cool and the fresh air is still. The dawn of a new day glows red with promise. You feel the warmth of the sun’s rays wrap around you as the sun crests the horizon. The morning beauty fills your heart with joy. 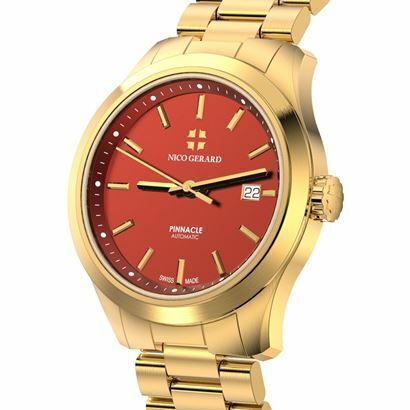 The red face of the Nico Gerard Sunrise PINNACLE lets you experience the excitement of a sunrise as this unique work of art graces your wrist. The 18 karat gold is from special ingots made specifically for the Nico Gerard Sunrise PINNACLE. This is the ultimate junction of craftsmanship, splendor, fashion, and technology. 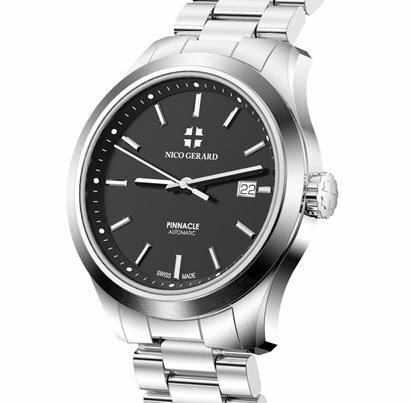 The Nico Gerard Sunrise PINNACLE is limited to 88 timepieces. Nico Gerard watches are technology-driven luxury timepieces that are innovative modern classics. All Nico Gerard watches are officially-certified chronometers and Swiss Made. Nico Gerard’s mission is clear - create uncompromising timepieces that connect people to the rich traditions of Swiss watchmaking and the technology of our everyday lives.